The canopy of shade shared through summer, her hues once green now orange and red. Each day her leaves fall slowly upon the ground. Harvest season is surely abound. While many poets seem to use the Autumn season in melancholy writings, Autumn is also a time to celebrate. 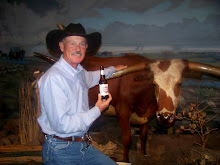 Ranchers buckle down to ensure they have enough feed for livestock to survive the long hard winters. Farmers take to the fields cultivating the array of crops. Once harvested by every man, woman and child, the rural communities came together to help their fellow neighbor. The harvest season was always followed by celebrations of food, music and community gatherings that have been influenced by ancestral past. The Autumn harvest is celebrated in many different ways across the nation. 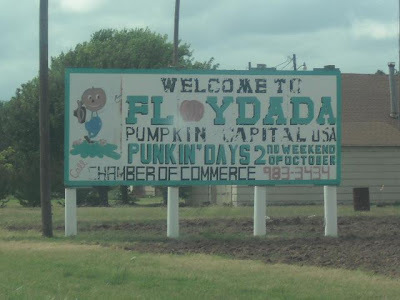 Floydada, Texas known as "The Pumpkin Capital of the World" celebrates their harvest season with "PUMKIN DAY" held on the Second Saturday of October. This attraction brings thousands of visitors from everywhere to the downtown event. Over 70 arts and craft booths along with many food vendors line the streets near the court house with hourly entertainment provided under the town square Pavilion. The day is filled with games for all ages. As the night sets in, folks take to the street for the annual free street dance that closes out the festivities. Lisa Witherspoon Schultz shown in the photo, is a proud Texas mother of two children; her son Jared who just graduated from Petersberg High School last May and her daughter Kim, who graduated from College at UTPB and currently Head Coach, Girls Varsity basketball at the Petersberg High School. 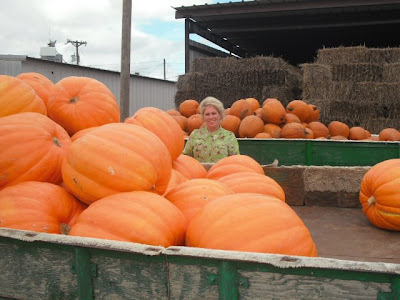 Lisa, loves to attend the annual Pumpkin event stating, "There is so much to do and see with the many arts and crafts displayed while you walk along the town square. Joined with great food and some fun competition it is exciting to watch as others compete in the many fun activities including, Pumpkin Carving, Pie baking, Seed Spitting Contest, Pumpkin Bowling and Rolling the giant Pumpkin gourd competition." Floydada, just northeast of Lubbock, Texas is in the southern Panhandle region of Texas. 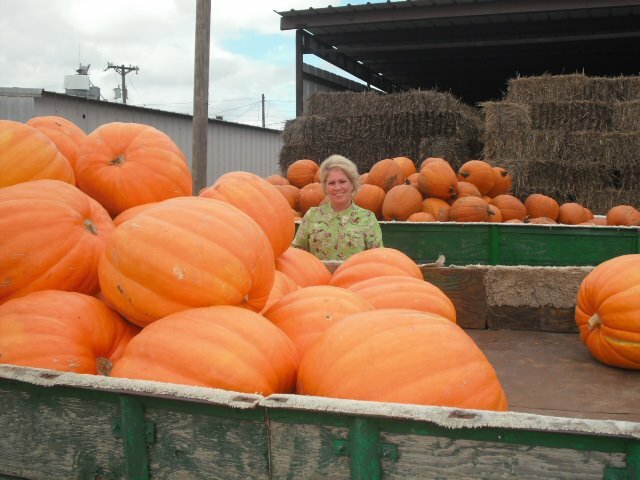 This area produces mostly cotton, milo and corn, but on approximately 1600 acres in the county, they grow an estimate of 50,000 pounds of pumpkins per acre. That’s nearly twenty million pumpkins. Pumpkins are native to the Americas finding it's way to Europe when Columbus returned to Spain carrying with him, Pumpkin seeds. The pumpkins in Europe were grown to feed pigs and not used for human consumption. The early Native American farmers were practicing an early form of sustainable agriculture. Planting squash, corn and beans together, the crops thrived. Corn served as the natural trellis for the beans to grow on strengthening corn stalks on windy days. The bean roots set nitrogen into the soil that nourish the corn while squash plants shelter the shallow roots of the corn and shaded the ground that discouraged weeds while preserving soil moisture. The practice called "Three Sisters" is widely studied in modern agriculture. Native Americans roasted pumpkin strips over campfires and used them as a food source, long before the arrival of European explorers. Roasted, baked, parched, boiled or dried, the Indians found numerous ways to prepare and eat Pumpkins. Seeds also roasted were often used as medicine. They also used the flowering blossoms in stews. Early breads were made by drying the pumpkins and grinding into a flour like substance that could be stored for months. Interesting facts about Pumpkins: While Orange color pumpkins are widely known, did you know they also grow in colors of Green, Yellow, Red, White, Blue and Tan. The Term "Pumpkinheads" comes from early colonist of New England who used the pumpkin shell as a template for haircuts giving a uniform round finish. The cut was called "Pumpkinhead." Pumpkins were used for Native American medicine: Modern medicines looks at pumpkins to help eliminate freckles, once used as a remedy for snakebites, are used in a number of facial and anti-wrinkle cremes, contain zero cholesterol, are low in salt, contain beta carotene which helps to reduce certain types of cancer and lowers the risk of heart disease, and pumpkin seeds help to reduce the risk of prostrate cancer. At the second Thanksgiving Celebration, it is documented that pumpkins were served. Although while we picture a perfect crust pumpkin pie, in fact, the Pilgrims removed the top of the pumpkin, then scooped out the seeds and filled the cavity with cream, honey, eggs and spices. Placing the top back on, the pumpkin then was place in the ashes of the firepit to cook. Once baked, the blacken shell removed and the content scooped out that resembled much like a custard. Other areas claim to be the Pumpkin Capital of the World. Morton, Illinois self-proclaimed, due to the Libby Industry Plant for canning pumpkins is located there in Morton. 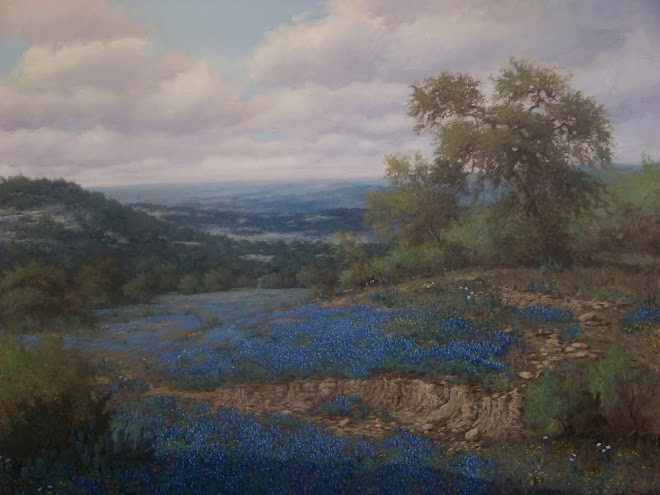 Additionally, Half Moon Bay, California claims to this title, but everyone knows the real capital lays in north Texas in the small town of Floydada.